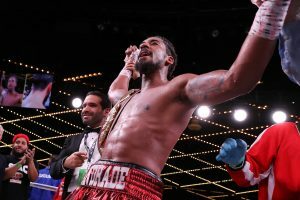 NEW YORK – Demetrius Andrade believes himself to be at the top of the pile at 160 pounds, and he is keen to get in with persons who pundits rate even a notch higher than he, like the Canelos, and the Golovkins. But on this night, an Akavov would have to do. Andrade, one of the top pugilists to come out of New England in the last few decades, entered the ring at the Hulu Theater at Madison Square Garden Friday night in possession of the WBO 160 pound crown. And he exited with the same strap after notching a stoppage win over Artur Akavov. The end came when ref Arthur Mercante Jr. pulled the plug at 2:36 of round 12. There were 4,748 in the building, and most in the building didn’t seem to be on board with Mercante’s call. Akavov was upset with the call, but he showed more passion in the protest than he did during the fight. A right hook landed on Akavov, causing him to back up. Andrade went after him, landed another right hook, clean, but it didn’t seem to buzz him. Nevertheless, Mercante stepped in, and said it was over. He tried to explain his reasoning to the Russian, who wasn’t having it at all. Each judge gave Akavov a single round, the cards showed. 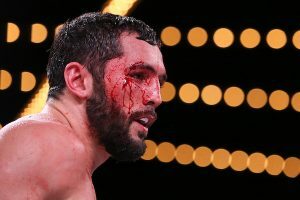 The 26-0 (16 KOs) Andrade, repping his native Rhode Island, is 30 years old; the 33 year old Akavov, known as The Wolverine, was best known for performing above expectations in a loss, to Billie Joe Saunders in 2016. In the first, Andrade had the speed and sharpness edge. In the second, Andrade took it to his fellow lefty; his jab was on point, and he looked to land clean with the long left as well. His work underneath impressed many in the stands. Akavov hadn’t yet figured out what in his arsenal would counter Boo Boo’s strengths. In the third, he didn’t figure that out either. In the fourth, Andrade was still in total control. He had to work hard to dodge and slip shots when Andrade went into flurry mode late. In the eighth, Akavov pushed at Boo Boo, went into another mode, that being aggressive. Then he went back to passivity. In the tenth, we saw blood on the Russian. That perked up Boo Boo, but Akavov was peppy enough to defend smartly, mostly. In the 11th, Boo Boo pumped a jab, politely stalked, and was cruising to victory when the fight was halted. The post Demetrius Andrade stops Artur Akavov in 12, retains WBO middleweight belt appeared first on The Ring.